The guitar to put Fender’s acoustics into the limelight? A full-bodied sound with superb projection - at a fantastic price. Clean tones with big, vibrant sound. More comfort for left-hand needed in the cutaway. 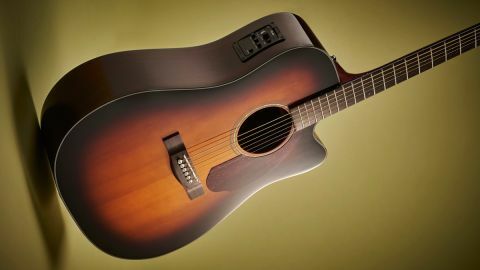 The new CD-140SCE dreadnought cutaway guitar is a top-tier model in Fender’s Classic Series, as launched at NAMM 2017 (alongside a myriad of other upgrades and guitar-related offerings). It has a smart, sunburst solid spruce top festooned with a CD Series pearloid rosette and tortoise-shell pickguard. It features rosewood back and sides, which show off a rich, dappled even grain. The sides are darker than the back, almost matching the darkest shade of the sunburst. A trim, black and white striped binding skirts the body of the guitar, drawing attention to the classic jumbo-cutaway shape. On the back, there’s enough contrast of tone in the wood to fool you into thinking that there are hidden depths, much like a magic eye illustration. There’s no trickery here though, just honest, solid acoustic guitar craftsmanship. The neck is made from mahogany, which has a very similar hue to the rosewood back. The fingerboard is made from rosewood. Decorating it are the ever-useful 3mm pearloid dots for markers (echoing the corresponding dots on the side of the neck). The overall shape of the neck has been designed for maximum comfort too, marketed by Fender as ‘Easy-to-Play’ with a slim profile and rolled fingerboard edges, which makes it perfect for players who like to wrap their thumbs around the neck. The headstock comes with chrome die-cast machine heads and is finished off with a swish - Fender’s obligatory logo. Compared to Fender’s Paramount Series of guitars, launched in 2016 for the gigging and recording musician, the Classic Series is geared more towards the entry-level player. That’s not to say it doesn’t come with some advanced technology: it features a Dual-Action Truss Rod (as well as helping with any undue bowed necks, it’s a nice feature, allowing you to alter the action to your own custom setting); a Fishman® Presys Plus preamp with a built-in electronic tuner (a must-have for gigging guitarists, it’s simple to use and provides good all-round tone control - it’s a relief too that the guitar doesn’t have to be plugged in to use it). Overall, the finish is as refined as some of Fender’s Deluxe or Paramount series models. There are no glue marks, no blemishes to show it’s a lesser grade instrument. At the same time, it doesn’t feel like it’s been dressed up to appear more expensive than it is - as some guitar makers do with over-elaborate inlays. Inside the guitar you can find quartersawn scalloped “X” bracing (try saying that quickly). This type of craftsmanship is more commonly associated with vintage series models - hence this model being part of Fender’s Classic Series. Compared to the non-scalloped variety, what this means is that the top has more freedom for movement, which makes it more responsive, gives the sound more volume, and perhaps picks up more of the bass. As a result, many guitars which have scalloped bracing favour bluegrass playing or any musical genre which needs that extra depth of tone. Whether that’s the case with this model, we’ll now find out. To play, this acoustic Fender is weirdly infectious. Something about it takes us back to jamming at school, like it might end up on the back seat of a car, partially broken, a couple of snapped strings, but with just enough life to muster up a hungover and rather gravelly rendition of Good Riddance. Except it’s not like that at all. The bass tone does have a full sound, but then so does the mid and upper range. This guitar has the perfect mix of elements. It is first and foremost alive. The rosewood back and sides and spruce top vibrate like one machine: a taut piston with surplus energy to burn. It is as responsive as it is glossy. The whole instrument, from top to toe, has the gloss finish (apart from the fingerboard). To strum it has a sharp attack: as crisp as it can get without turning into distortion. It also has a very natural twang and buzz - perfect for blues and country playing. The harmonics are crisp too, though perhaps don’t project as much you’d expect with the larger body. Fingerstyle playing is clean which provides great contrast when switching between that and strumming at chords. Playing Simon & Garfunkel’s The Boxer provides a heady experience, moving from the fingerpicked verses to the strummed chorus - the jumbo size of the guitar allows it (and your own vocals) to really project too. The cutaway is a good asset for this guitar’s arsenal as well. It provides ample space for access to the top of the fingerboard. One small thing to mention, though, is a slight awkwardness in the way it feels on the heel of the left hand. It’s maybe something to do with the way the cutaway isn’t completely flush with the neck. The top end of the side continues a little past the heel and then dips 90 degrees into the body (for the cutaway) - so it starts to look a little boxy, disrupting the big jumbo curves. It doesn’t affect the sound but the left hand has to rest on multiple surfaces to reach the top end, which is a little uncomfortable. The overall sound has a natural sweetness of tone - not sweet in the mellow way but in the pureness of the sound - each string carries precise projection. Add some slow vibrato in the left hand on the mid-lower range and you can simulate some darker, mellow tones (if that’s what you like). As a point of comparison for tone, when played alongside a Sigma OMM-4 model, which obviously has a smaller body, there is a similar clarity of tone. The tone of the Sigma has an introverted warmth. Surprisingly the Fender can nearly match this too, irrespective of the size-model difference, although you do have to play with the right hand right over the fingerboard to achieve this. Playing at the other end of the guitar, by the Rosewood bridge, the sound difference is less noticeable. Where you’d usually find a harsher tone to vary up repetitive musical strains in fingerstyle playing, the sound is still (quite impressively) loud and full. We have to go right to the extreme edge of the bridge to get that harder tone. While the beginner may not need this resource until later in the learning curve, it is this sort of sound quality which shows how this model has been crafted more for beginners than seasoned professionals. Reclining with the Fender is acoustic comfort personified. The proportions are perfectly designed so it has perfect balance. The right arm has excellent poise: the larger body puts the right hand a good distance from the strings and provides a bigger resting ground above the elbow. It has an easy action and the neck feels like it’s been molded to fit the left hand. Comparing this guitar with a Tanglewood Rosewood TRD-VS you can clearly hear all the notes the Fender has. The evenness of tone across the strings is consistent, and responsive: if you want more you can have more, particularly in the lower range. The definition on the Fender is crisp, whereas the Tanglewood lower range suffers from a little muddiness. The way we’ve described this guitar, you might be forgiven for thinking it’s virtually incomparable and only available to those with larger pockets. But Fender has been honing its craft since 1946, learning from its players, improving models, resourcing high quality affordable woods and machinery. All that boils down to a staggering offer for the CD-140SCE: with a price tag of £330, this guitar is an absolute steal. Not to mention it also comes with a very impressive coffin-black hardshell case. It feels durable and weighty. It’s a shame that all guitar makers don’t supply cases with their instruments - it simply makes sense to protect something so carefully designed (though Fender has some distinct advantages, being Fender). This guitar has been pitched by Fender at any aspiring player - but we would say even the more experienced players can get some good sounds out of it. It may not have the variety of tone for advanced soloists, but it has an everyman appeal and enough panache to fool you into thinking it’s worth more. The Fender preamp and end pins makes this guitar arena-worthy (or maybe just your local open mic), though excessive stage wandering with a dreadnought-sized instrument is probably not recommended. If you know someone who wants to learn, or wants to amp up the volume, it’s a no-brainer - buy it!